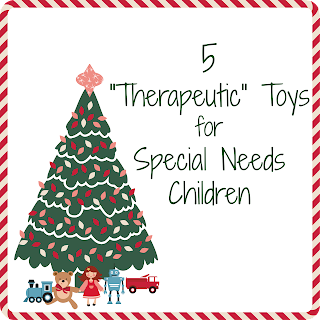 Ever wonder what kind of toys to get for a child who has special needs? I always talk to the kids' therapists as birthdays and holidays approach, and discuss with them goals and home program. While they are very willing to do "therapy" at their sessions, one or two hours a week is not enough to make progress. They have to work at home, too. While sometimes there are bigger, more therapy-specific items that are most beneficial for their programs, often we are able to come up with a list of things that look like fun waiting to be opened and help us reach therapy goals. Check out the rest of our top 5 toylist at Frugal Homeschool Family! Head on over, check the list, and finish up your shopping for the perfect gift for the special needs child in your life!